Having established a journal practice in class, I found multiple ways of using it for day to day assignments. One advantage of the journal is archival. 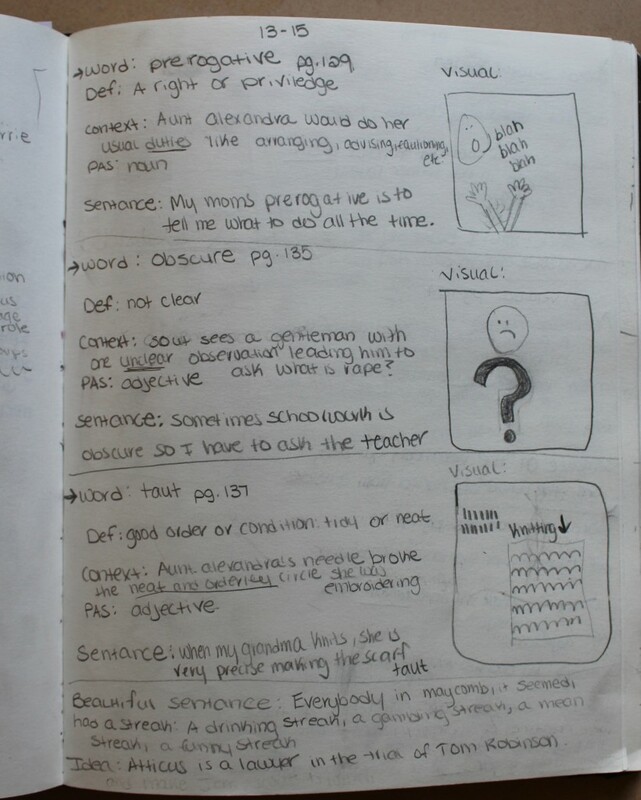 Students begin with their work at the beginning of the year and keep adding to the pages as the year progresses. They can look back, refer to their previous work, re-read and use as a source. Students have a record of their ongoing learning, an archive. The assignment here was to place image work along side their word-work. I don’t do this with every set of vocabulary words. As a visual literacy strategy, the word and the understanding spill into the experience of learning. Later, the student can look back and ‘see’ what they know. As is the case with drawing and designing, they often feel the urge to re-vise both. I ask the students for context, part of speech, definition, an example, and a visual. Students learn words live in contexts with a narrative. Students create a unique iconography and links outside the text. The word then has a visual component along side a link outside the reading. Since the goal is practice and exploration, I can look at their work as a process of knowing and be flexible in my assessments. As their language use expands from ongoing practice in various modalities, students find more nuanced ways of communication. As their journal becomes an archive they see a residue of their growth or even see places where change is necessary. They continue to learn on their own. Interested in Shakespeare's plays and artworks based on Shakespeare's works? Check out our special project Picturing Shakespeare!